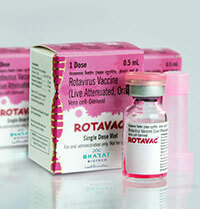 Rotavirus Vaccine (Live Attenuated, Oral) is a monovalent liquid frozen vaccine containing live rotavirus 116E strain prepared in Vero cells for the prevention of rotavirus gastroenteritis. Each dose of 0.5 ml contains NLT 105.0 FFU of live Rotavirus 116E. ROTAVAC® should be administered as a 3-dose regimen, 4 weeks apart, beginning at 6 weeks of age and should not be administered to children older than 8 months of age. ROTAVAC® has a shelf life of 5 years when stored at -20°C till the expiry date and can be stored for up to six months between 5°C ±3°C. Rotavac® received WHO-Prequalification in January 2018. Rotavirus 116E is isolated from asymptomatic neonates in 1986-88 at the All India Institute of Medical Sciences, New Delhi. ROTAVAC® was developed as a Social Innovation Project under a public-private partnership involving highly-regarded national and international organizations. The multi-centre phase3 efficacy and safety clinical trial on ROTAVAC® was India’s first and largest efficacy clinical trial on vaccines. It was successfully completed in September 2013 after a 2-year follow up of the infants. Results of this study were published in the Lancet. The vaccine efficacy of ROTAVAC® for severe non-vaccine rotavirus gastroenteritis was 56.4% [95% Cl 36.6, 70.1] in the first year of life and efficacy in the second year was 49% [95% Cl 17.5, 68.4].